Visitor profiles allow visitors to sign in and share their contact information. It can help you to keep track of visitor details, including name and contact information. 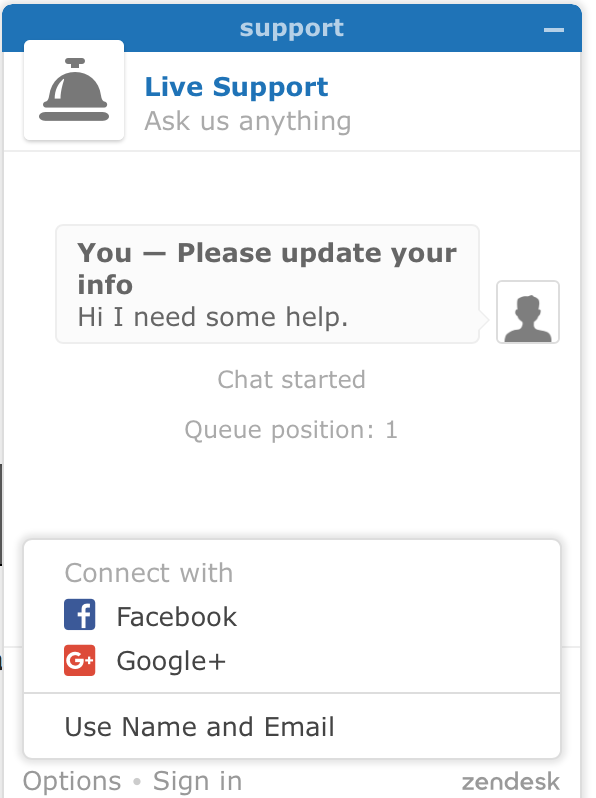 When visitor profiles are enabled, visitors can enter their details at any point during a chat. If the Pre-Chat form is also enabled, visitors are also prompted to enter this information when initiating a chat. For details, see Using the Pre-Chat form. If the Offline form is enabled, visitors can also enter this information when leaving an offline message. For details, see Editing Offline Form settings. You can manage settings for visitor profiles by selecting Settings > Widget > Forms tab > Visitor Profile section. By default, visitor profiles are enabled with the social login options selected. If the form is enabled with no contact options selected, visitors are prompted to enter just their names and email addresses. To allow unauthenticated visitors to enter their phone number, select the check box next to Allow Phone Number and click Save Changes. This option is disabled by default. To allow visitors to share details using social logins, select the check boxes next to Facebook and Google+. Click Off, then click Save Changes. Is it possible to disable editing the user details by the user. Users are authenticated through SSO and them being able to change their email will create major issues. How can I remove the pencil and logout button? If you authenticate visitors using the authenticated visitors API, they won't be able to edit their information. Is it possible to disable editing the user details by the user without using your authenticated visitors API? Currently, it is only possible using authenticated visitors. The only alternative would be to build a custom widget using the Web SDK that hides the ability for them to set/edit but it would not prevent updates via APIs. Easiest solution would be to authenticate visitors at this point in time.